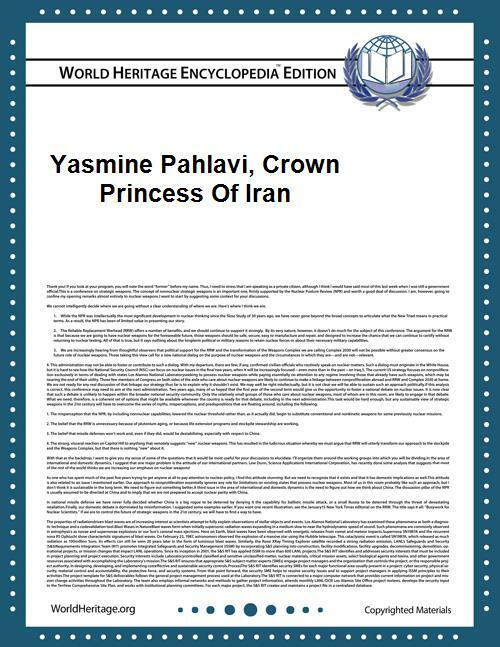 Yasmine Pahlavi (née Etemad-Amini, 26 July 1968; Persian: یاسمین پهلوی‎) is the wife of Reza Pahlavi, the last crown prince of the former Imperial State of Iran. Yasmine Etemad Amini was born in Pars Hospital in Tehran, Iran, on July 26, 1968. She attended the private Tehran Community School in Tehran until the rising tensions in the late 1970s forced her family to leave Iran permanently. They settled in the San Francisco area in California where she attended and matriculated Notre Dame High School. She is a graduate of The George Washington University, obtaining a B.A. in Political Science, and Doctorate in Jurisprudence from The George Washington University Law School. She is a member of the Maryland Bar Association. She worked for ten years as a staff attorney for Children's Law Center in Washington, DC, representing the rights of at-risk youth. She is the Co-Founder and a Director of the Foundation for the Children of Iran. Started in 1991 with Nazie Eftekhari, the Foundation's mission is to marshal the considerable resources and goodwill of the Iranian diaspora coupled with remarkable expertise and generosity of the American medical community to treat Iranian children suffering from complex medical conditions. Organized under the 501(c)(3) rules of Internal Revenue Service, the Foundation has faithfully fulfilled its mission restoring the health and quality of life for scores of Iranian children regardless of race, religion, or political affiliations. The family lives in exile. Yasmine Pahlavi has been a vocal supporter of the democracy movement in Iran, appearing at several pro-democracy rallies occurring after the 2009 election upheaval in Iran.